Located on the northeast extremity of the Iberian Peninsula, Catalonia is an autonomous community of Spain and consists of four provinces: Barcelona, Girona, Lleida and Tarragona. 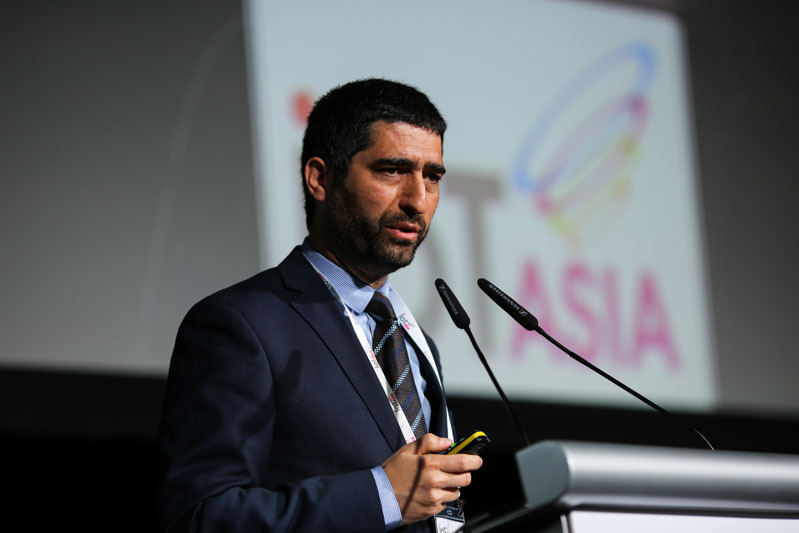 Mr. Jordi Puignero I Ferrer (above photo), Secretary for Telecommunications, Cybersecurity and Digital Society, Government of Catalonia was in Singapore recently as an invited speaker of IoT Asia 2017. OpenGov spent some time with Mr. Puigneró to learn about the Catalonia’s government proactive role in ICT development, collaboration with other European regions, challenges faced in his role and more. Could you tell us about your role as Secretary for Telecommunications, Cybersecurity and Digital Society? My Secretary position reports directly to the Presidency of Catalonia That decision was taken because we thought everything which has to do with ICT is going to be very strategic in the following years. a) Everything which has to do with the deployment of electronic communication infrastructures throughout Catalonia. It’s essential in order to be able to give connectivity to all people living in Catalonia, not only in big cities like Barcelona but also in small and medium cities so that everyone has equal opportunities in terms of accessing Internet and data services. Because obviously, market opportunities are not the same. In Barcelona, operators are providing connectivity and data services but when you go to other parts of Catalonia with lower density populations, rural areas or mountainous cities, companies don’t see business opportunities. So we have to make an effort from the government to facilitate those operators to deploy services in those areas. We’re building a neutral network for the whole Catalonia in terms of broadband and mobile technologies. That’s one of the big areas I am responsible for. b) Secondly, digitalisation – that means being able to, in all areas of the government and the country use digital services and digitalise themselves so that they can provide better services and be more efficient. This is one of my important policies and that means in education, health and industry, in all those areas and trying to foster in Catalonia a new industry, which is the data industry. We can really become a digitally-driven economy. c) Cybersecurity – we live in a world which has seen some episodes of cyber attacks and we need to make sure we make the digital world secure. My role is to protect Catalonia digitally from any cyber attacks and also to provide services to the citizens and companies in Catalonia in that aspect. d) Lastly, to foster a policy of research and innovation in advanced digital technologies. That means my responsibility is to align some technological centres in Catalonia to speed up the research in technologies such as 5G, blockchain, quantum tech and IoT tech which will be crucial in the next 5-10 years. By funding technological research specifically in those areas, we are trying to accelerate the process of innovation. The Catalonia 2020 (ECAT 2020) strategy was established in 2015. Could you give us an update about the progress with the strategy so far? The Catalonia 2020 strategy is basically our smart nation strategy. We started very strong, first of all, in issues regarding connectivity because connectivity is essential towards becoming a digital society and economy. Here we have 2 main projects, one is, as I said, building a broadband neutral network around Catalonia. We have already deployed more than 3000km of this network, this is a public network but we don’t provide end services to final users. This network is spread throughout the territory so that operators can connect to it and provide the last mile services. We promote competition between private operators so our goal is to facilitate with this neutral network, the broadband fiber network. We have also built towers for mobile operators – we construct the towers, electrify the towers, we connect the tower to the fiber network, and we tell the operators that there are these towers and they provide mobile services. So we facilitate mobile operators to deploy mobile services around Catalonia. We do this for the same purpose as the neutral network because we want to accelerate the process of how the mobile operators work, especially in the less populated areas. This is the purpose of these investments. So we started this project some years ago and in term of fiber, we’ve deployed more than 3000km for the boardband neutral network and in terms of towers, we have built 500 towers. Our Smart Catalonia started very strong in connectivity. We have updated the smart nation strategy in 2016 with other topics – we have prioritised certain topics such as specific programmes for smart nation, because our industry is lacking ICT professionals so we need to orientate our children to study and prepare themselves in all digital areas and skills, specifically in Science, Technology, Engineering and Mathematics (STEM) programmes. We’ve built programmes which we have launched to schools from 1 year ago. The other topic, which we are starting now, is creating a nationwide platform for IoT sensors so that all sensors that are used for capturing data can share their information in an open platform. This is very important because from all the information that we gather from cameras, humidity sensors, climate sensors, mobility sensors, traffic sensors can be shared on a common platform. We also started the research and innovation programme in terms of advanced digital technologies. As I said before, blockchain, 5G pilots, we’re funding in terms of quantum technologies, a centre for doing research. We’ve been in contact with the quantum technologies centre in Singapore. Do you work with other Catalonian government agencies or European government agencies in achieving the ECAT 2020 strategy objectives? Inside the government in Catalonia, we have a steering committee for the Smart Catalonia strategy, for which I am the President. In the steering committee, there are members of each of the departments of the government. Each department has a secretary-general, for instance, education and manpower. Each of them come to the committee once a month so we direct and govern the Smart Catalonia strategy with this commission so that we can align the policy. With other European regions, we have strong relationships with 3 regions – with Baden-Württemberg in Germany, with Rhône-Alpes in France and with Lombardy in Italy. We have a lobby of these 4 regions in Europe, we call ourselves the Four Motors of Europe. This is because these 4 regions are somehow the more powerful regions in each of the estates- in Spain, Italy, France and Germany, in terms of ICT. In this alliance, we share and decide every year which region will be the president of the lobby. In the past 2 years, Catalonia was the president and every year we will decide which are the key topics that we want to foster. 2 years ago, we decided that the topic would be the smart region strategies. This year the main topic is big data. This is a way for us to exchange initiatives, policies and collaborate with the other regions. We interact with the European Union towards the Digiconnect, it’s the Director-General of Connectivity in Europe, in various programmes. Specifically, we are working on 5G, IoT and broadband mapping. What are some of the major ICT and digital initiatives and developments that the Government of Catalonia is embarking on now? Our healthcare system is very powerful but it’s a bit old. The system was designed in the 1980s when people would retire at 65 and would die on average at 72. The system only had to account for a 7-year period on average. Since old people are the most intensive users of the healthcare system, now they live up to 82 years. So that means our healthcare system needs a lot of money so we need to make it more efficient because otherwise we will not be able to pay for it. So it means that digitalisation in healthcare is important, it means that we need to empower our citizens with a lot of strategies like wearables and health apps that can be used for people towards having a better health. Introducing all these new things to the healthcare system is also one of the big issues we have now and we are now beginning with the changes in terms of policies, mentalities, culture and personnel. It will take at least 5-10 years for the transition but we need to start. What are some of the major challenges that you face in your role with the Government of Catalonia? The political situation in Catalonia is the same as Scotland, Catalonia also wants to do a referendum in the future so politically I am in-charge as well of preparing technically all these issues. That’s a big challenge for the next year. This is a big issue in Catalonia right now, people have decided in the end to do a referendum. To say that and to prepare that, it takes a lot of time so it means also a lot of technical issues and I am partly responsible for taking care of that. That’s the bug challenge I have in the government. The other important issue is that our Smart Nation programme really gets buy-in from all departments, it is not easy so that every minister of the government really understands the importance of the digital revolution.